The Quick Rain Slick (QRS-models) is a new hybrid cover. Custom fitted to the camera like the mini-DV rain slickers but using the light weight material found inside the Shoulder Cases for broadcast cameras. A clear vinyl window helps you see critical controls and the LCD screen while shooting in the rain, dust and snowy weather. You will have easy access to battery, recording medium and all important controls and accessories. Use it on the tripod or hand held. 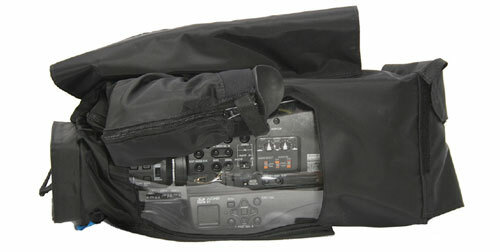 Especially useful for the Panasonic AG-HMC80.